More than 20 poets, musicians and performers took the stage for the GCU poetry and journalism club’s Spoken Word Open Mic Night. 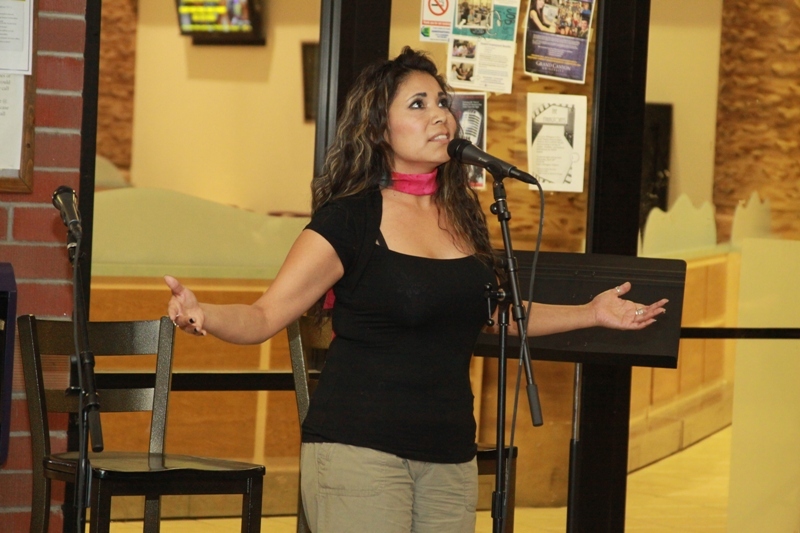 Students held their own with some of the Phoenix area’s most talented spoken word artists. Event host Lalli set the tone with an intro piece about not judging a book by its cover. He did an excellent job explaining the open mic platform for people who have never been to or performed at an event such as this. In keeping with Lalli’s promise of unpredictability, performances ranged from a capella vocals (Michael Hand covering Beyonce blew everyone away) to the spoken word dramatics of FlipSide to classical storyteller Mark Goldman. There is something for everybody, and all of it was good. Poetry club advisor and GCU instructor Judie Kupillas was the first performer, foreshadowing much of the evening with a “pregnancy poem” full of insights, humor and emotion. The event was a roller coaster ride for the next two and a half hours. Lalli promised the return of his Infuse open mic nights in the near future, featuring many of the artists who performed at GCU. For more information, and to check out a video of Lalli’s events, visit http://www.youtube.com/Lallipoetry. Click on the photo slideshow for photos of every performer.